One NOT to be wasted indoors. At least Saturday anyway. It rained all day Sunday. But the temps were great! It felt like summer was saying a slow goodbye. 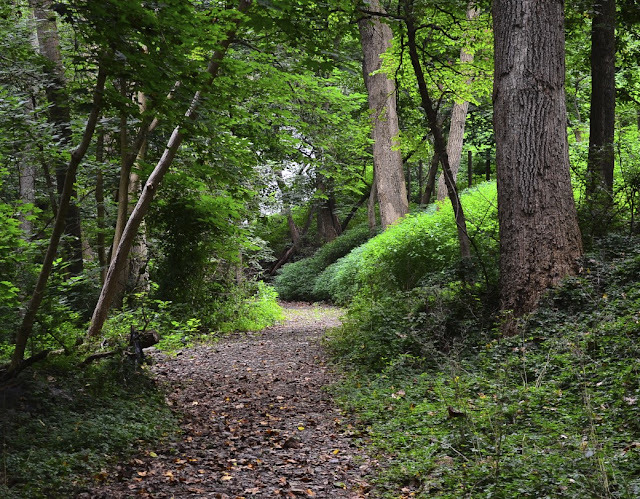 Within walking distance of our home are some trails The Professor and I like to hike occasionally. So we headed on down there but were greeted with this sign. The Professor and I spent a few minutes contemplating if we should enter or not. We thought if their aim was as bad as their spelling, we were safe. ..... a large bamboo forest! It's the coolest thing. Something I didn't expect the first time I happened on it. On our way back, we noticed some tree carvings. 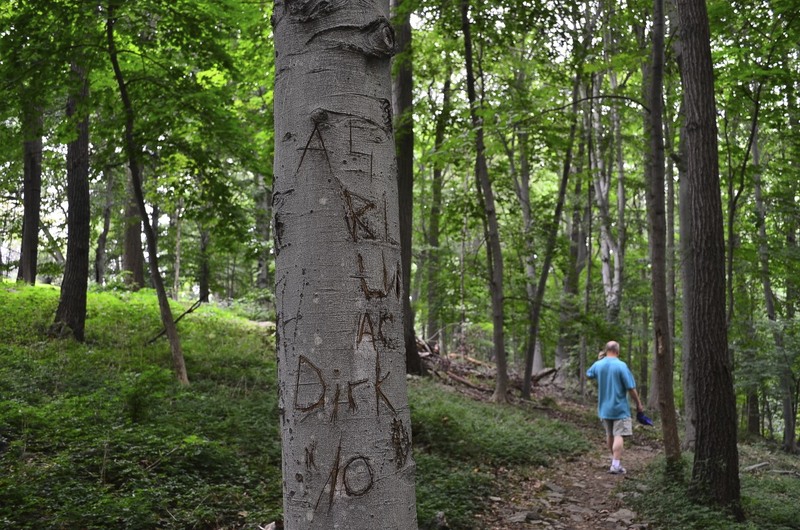 Tree graffiti .... not good Dirk! 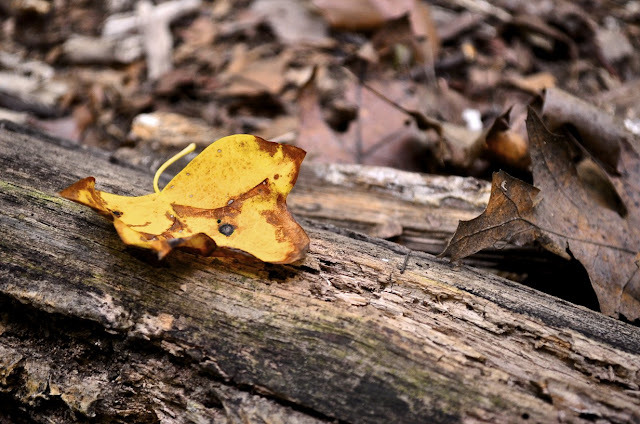 I couldn't help but notice a fair number of fallen yellow leaves. Summer postcards to fall. After our hike, we didn't feel like heading home just yet and drove over to one of our local farmer's markets. I love wandering amongst all that color and I was not disappointed. But what WAS disappointing upon returning home, was that our freezer seemed to be on the fritz. Ugh! We had to haul everything out and put it in our other fridge. And it had been such a great day. Guess the universe thought I had too much joy for one day and needed to even things out. I say phooey on that. Anyway, guess I'll be entertaining a repairman on Monday. And now, for that special treat! Well, I had not seen her for two weeks while she was taking care of her new brood. Well, today, was MOVING day! She apparently didn't like our old cherry tree and was moving her babies from our backyard to an oak tree across the street on the golf course. I mean, really! As if our view wasn't good enough! This was the best picture I could get of her ... she was moving pretty fast and far away. She did this three times. And each time, I held my breath as she crossed the street. One time, she STOPPED in the middle of the road! aaaarrrrgggghhhhhh! Golfers don't care about any ole squirrel when they have a Tee time to make! Now I'm just going to worry about her all the time crossing the road. But wait! So ... which one do you think I should get? I'll rest a lot better once I get my new sign. Hope your weekend was this much fun! Jillsy Girl Studio "Weekend Exposure"
Reena, you sure know how to put a great post together. I hope your squirrel mama is happy in her new surroundings... and staying safe on the other side of the road. Love ths signs. Looks like you've had a lovely weekend despite the whole freezer situation. I can't believe you got a shot of mamma squirrel with her little one. Amazing. 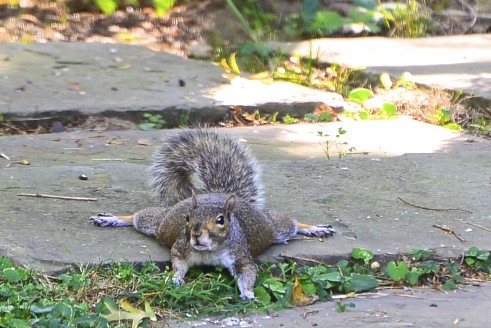 That shot of the mama squirrel is amazing. Talk about being in the right place at the right time. 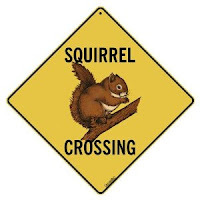 I like the sign with the brown squirrel better, but, I'm thinking that the other would be more effective. It's simpler, and a little clearer. And, when people have an eye on tee time, they need all the clarity they can get. Boy your lens takes some wonderful shots. The color at the market was outrageous. I was feeling a little maternal with the mother squirrel, and my heart, oh my heart, when you said she stopped in the road. Yikes!!! Will we get any sleep tonight? The bamboo forest is so very cool! Sorry to hear about your freezer. Love the squirrel and the farmer market shots. I vote for the all yellow sign. Have a great monday!! Yeah, I think the all yellow sign is brighter and more eyecatching. Wish there were paths like that near my house. (big sigh!) Also wish our summer was waning, but that's not the case for several weeks to come. Meanwhile, you enjoy the nice weather for us. And keep sending us the little "postcards" so we can enjoy it too. Well, I'll go against the crowd and say I prefer the sign with the word "crossing" as opposed to "xing." ohh how amazing to see her moving the little ones ~ and you got a shot ~ wow! how weird that she wanted to move?? Glad your MIA squirrel finally showed. She's so cute and a good mother to boot! Well, except for stopping in the middle of the road. I like the sign on the right best. Not sure why. I just love all of the beautiful colors and details of your photos. Great catch on the mama moving her baby! A lovely Saturday! I would love to do that walk, and the framers market. 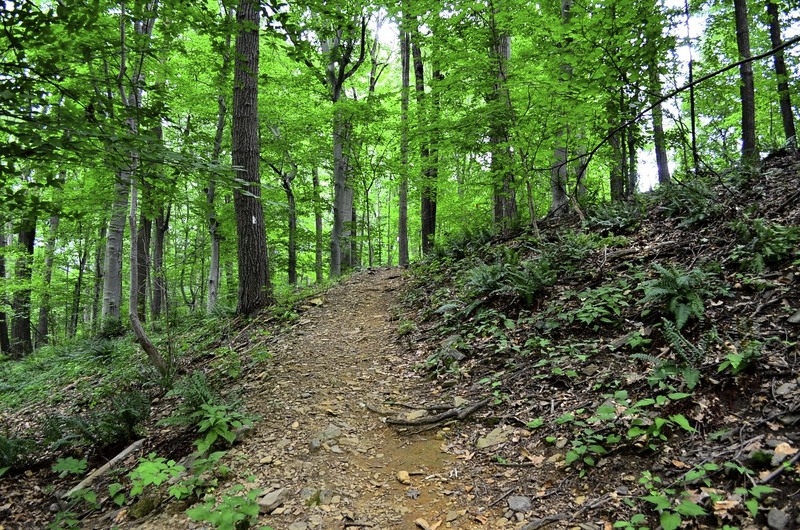 i love that amazing hiking path, what a great spot!!! i would for sure hang that yellow sign AND be out there directing traffic...what a sweet picture of momma & baby!!! What a delightful day, Reena! And your post and photos are terrific as always! Such a lovely place! Sorry about the freezer, love the farmers market -- always a favorite for me! And the little Mama Squirrel is adorable. I kind of like the brighter yellow sign -- hopefully catch more attention! Does sound like a wonderful weekend and I hope you have a great week!! cracked up at mama sprawled out. but the hunt in progerse sign and your comment about it sent me over! :) thanks, dearie! BUT oh my heavens!!!!!! Getting to see the Mama Squirrel moving her babies was just way cool.... and remember I'm not a squirrel fan! But that is so special!! Another post, another chuckle . . . my heart started to pound when I saw that leaf but then I felt better when I saw all that colour at the market! love the addition of the tractor! had to laugh at your squirrel. maybe you should just get her a bright yellow vest instead! Wow!!!! I thought the special treat was the awesome bamboo forest, I have never seen one. It looks like green sticks stuck in the ground! But then you gave us an even bigger surprise at the end!! I have never seen a mom squirrel carrying a baby, so wonderful!!!! Get the sign on the left, it is easier to understand. Are you really going to buy one? By the way, I would never have been brave enough to go on that walk with an archery hunt in progress!! The things we do for our followers! 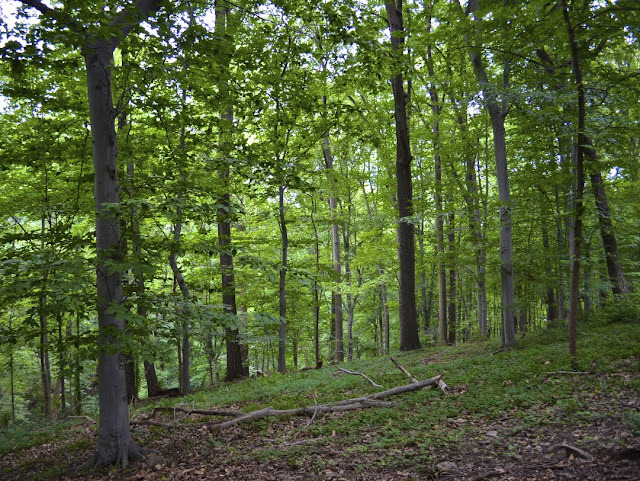 Hi Reena, your walk in the woods was beautiful! I'm so taken with your squirrel photos, too. I vote for the left hand sign! Thanks again for visiting. Good story and brilliant photos. wonderful shots here. i like the brighter yellow sign. 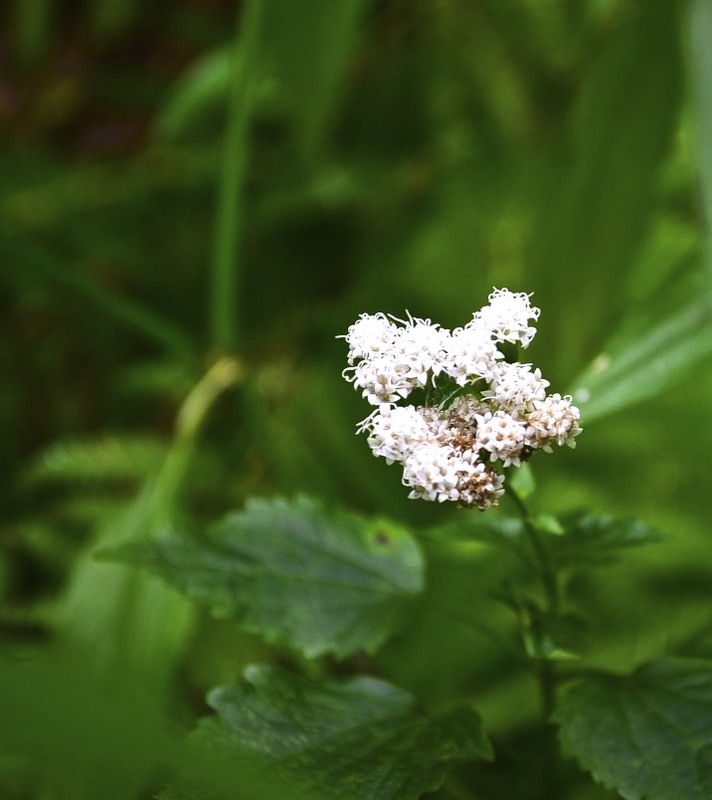 Gorgeous shots with your lens. I know what you mean about find an excuse to use some of those. Right place, right time. Great that you planned ahead! Amazing shots of Momma squirrel. I hope she is allowed to raise her babies in peace. I'm sure she'll be back to visit your "corn chair." Maybe she'll bring her babies along. Sorry about the freezer. 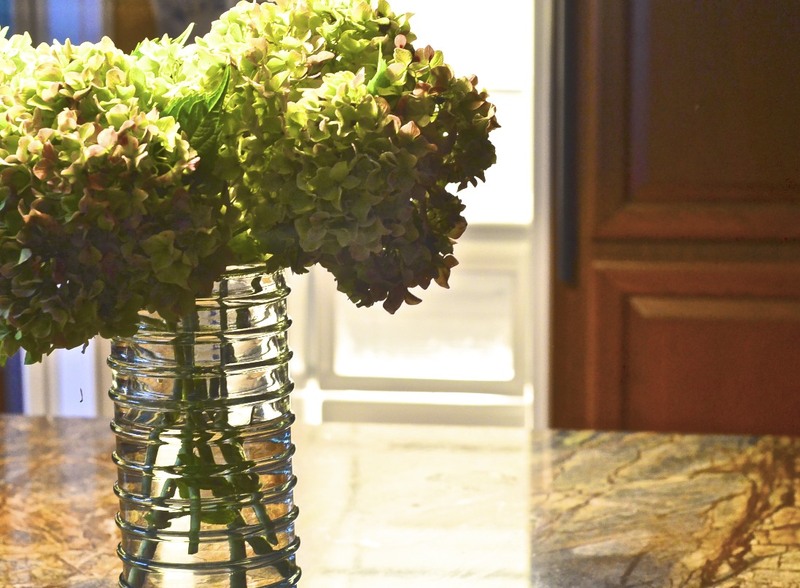 That happened to our old Firestone vintage fridge this summer. Kaput. 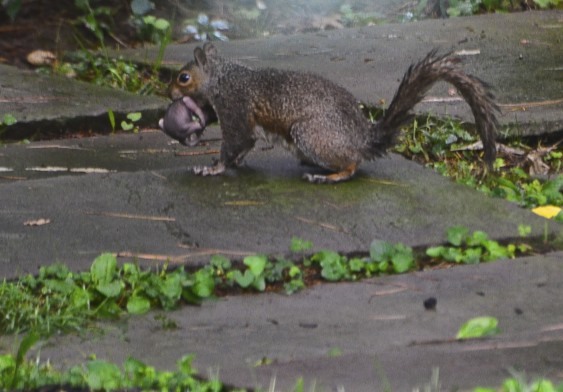 Great shot of the squirrel moving her baby. Love the one of her sprawled on the stepping stone! and how special to get a picture of her moving her babies! Wonderful post! I really liked your forestwalk and how great with the bamboos! OMC what gorgeous pictures and we thank you for sharing with us. You have a very beautiful trail for taking afternoon walks. Looks like a nice place to take a walk. Don't really think you have much to worry about with the Archers. Would think that would be around October when Archery season is open. A good capture with Mother squirrel and her little one. Great story Reena! i think you should get both and post them each way unless you live on a one way street! Great images of the forest with the shades of greens. I presume the squirrel was in need of more bedrooms, since she was moving. :) The sign to the left would be my choice. A wonderful post and a great set of images. Beautiful work. 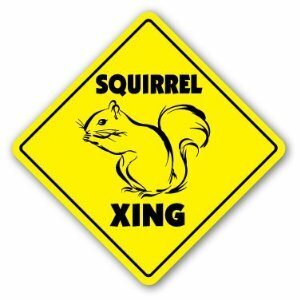 Squirrels are such a nuisance, but I love them anyway. How wonderful that you were in the right place at the right time to see Mama Squirrel move her brood. I'm glad that I'm not the only one who gets amused (and sometimes annoyed) at misspelled signs. Oh my, that squirrel is so sweet! 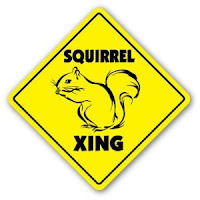 I prefer the sticker to the left - Squirrel Crossing (not Xing). 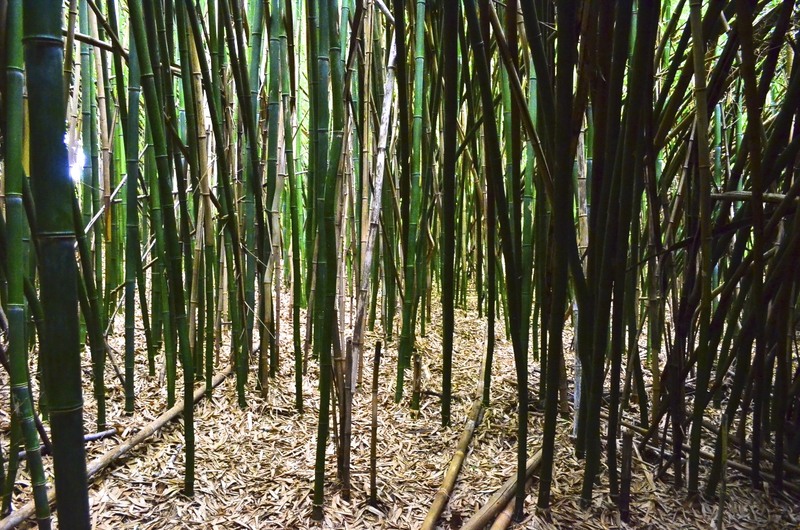 And that beautiful bamboo forest - just amazing! I love your forest shots, and the colorful market collage, and I'll vote for the 2nd squirrel sign. ahh! I love love this post! I'm so glad you put the picture up of her carrying her babes! I just found two baby squirrels the other day - one in the middle of the tree, one on the ground. They were a little older but still tiny. And I'm glad to know that mom will carry them around - makes me feel better :) Looks like a fun hike too, great pics all around! I so enjoyed reading this Reena! I absolutely love the collage, and congratulations to mama squirrel!!! Love that shot of her with her baby. How lucky you were to capture that! I'm so glad the squirrel made it across the street without incident! Nice walk in the forest. Bamboo? REALLY? But you didn't see any pandas, right? A little naked baby squirrel! What a fantastic capture! What beautiful photos! The farmer's market is so colorful. It's so awesome that you were able to get a pic of the mama squirrel and her baby. I've never seen a baby squirrel before. 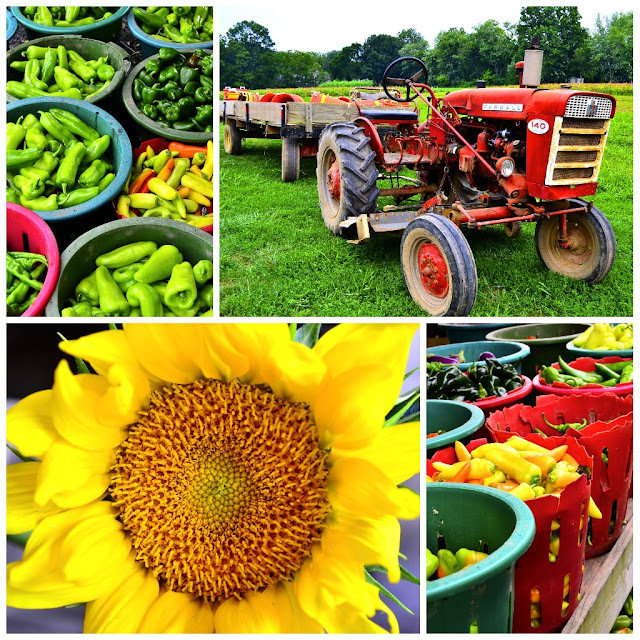 Love the farmer's market pictures! What a lovely hiking trail - I like the spelling on the sign too! Our mama squirrel has apparently moved her babies somewhere else, but i was not so fortunate to see them. I think the Blue Jays were making her nervous. Awww...too precious. Darn, her though. Now you'll have to go across the street to watch. I'm glad to hear someone was enjoying some moderate temps. The beach was WAY TOO HOT!! 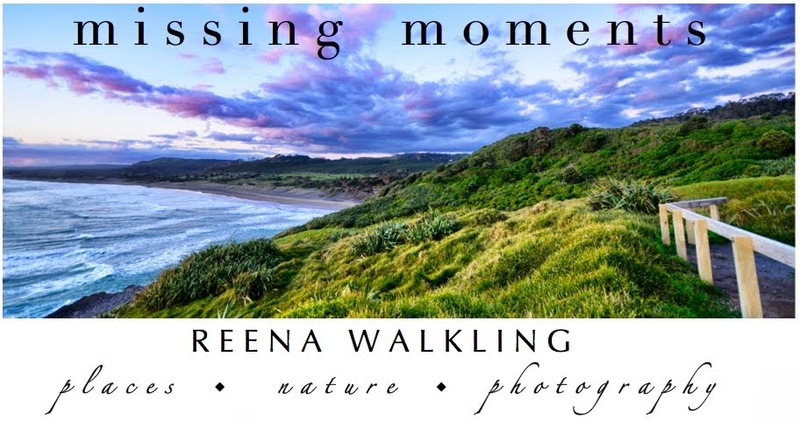 A fantastic post Reena...beautiful images and a very entertaining read. you are the queen of critter posts! love that mama squirrel. Loved your walk thru the woods and the visit to the Farmer's Market, but that squirrel shot of Mama Squirrel looking like she was totally exhausted made me laugh out loud....I definitely think the sign on the right, it stands out more. I like the Squirrel Crossing sign better. how lucky you are to have squirrels near you, they're adorable. where I live we don't have wild life. only our cats at home, lol :) it can be pretty wild sometimes, they're four! but most of the times they just sleep. love your blog :) thanks for sharing! well done. Well, hmmm, I think the one with the brown squirrel. LOL Can't say as I've ever seen a baby before. Fun shot! 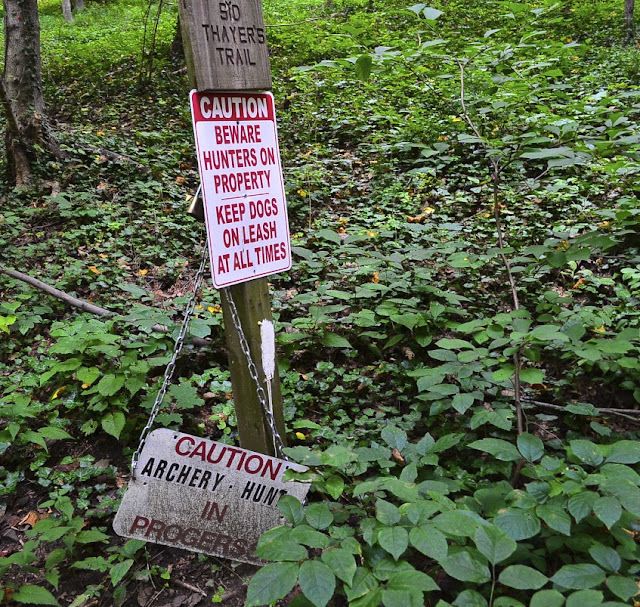 Love the walk through the woods, the bamboo forest, and the sign. In progerse? Did you actually see any archers? this is so cool....i had no ideas squirrels would move their babies to a new nest. i bet it was one of those cool 3 story townhouse nests. otherwise moving would have just been too much work for something like a one bed, one bath condo. i have to say, i've been seeing some of the yellow leaves too and it makes me sad. i love fall, but i'm not ready for her visit quite yet. Oh my goodness, that is the most adorable picture! I can't that I've ever seen a baby squirrel. So cute! I hope your sign works, you have me worried about her! I agree with Daryl. The brighter one may get people's attention. Fantasic colors. I love bamboo. Actually one of my fave plants. Beautiful forest. Cheers!! Glad no archers got you on your walk! Great photos! I like the sign on the right better. love the path shots most of all... i really do, i have a thing for photographing paths. 2nd = SHAME ON DIRK - BAD DIRK - if one is old enough to spell their name, then they're old enough to know where to write & where NOT TO WRITE, like on trees! I can't believe you caught mamma moving her babies & I've never seen a baby squirrel, til now... WoW! The signs remind me of a supposed real call the police dept answered that I heard about a few years ago... A sign stood in a woman's yard saying 'Deer Crossing' & after a while she calls the police dept asking if they'd come move the sign to someone else's property cuz she was sick of all the accidents by her house!!! =0 LoL! Now I'm gonna worry myself sick over that squirrel and her babies. Sigh. And sorry about the freezer. Why don't they ever break in January when you could store all the stuff outside until you get it fixed?